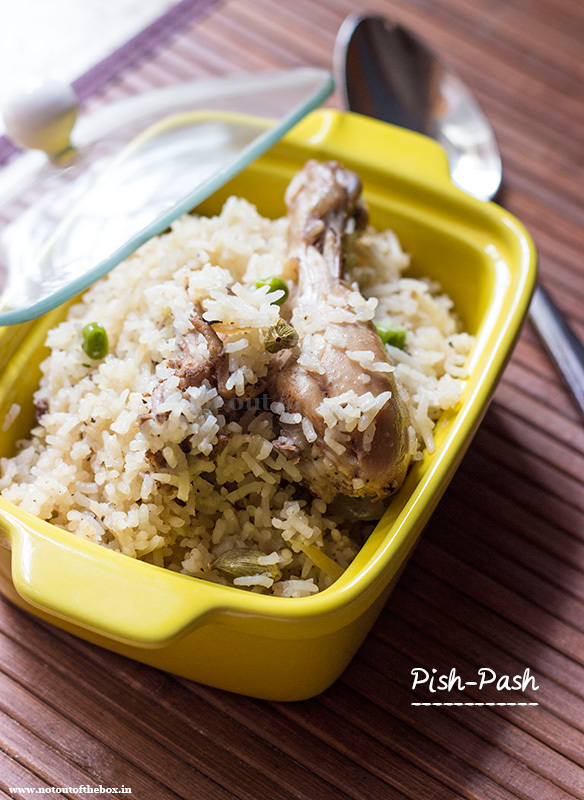 ‘Pish-Pash’ is an Anglo-Indian one pot meal, where rice is cooked in chicken stock along with the whole spices. This is a light, hearty and healthy dish. It’s an old recipe, getting lost with time. I came to know about Pish-Pash from my dear friend Monidipa di, she told me about this some time back, till then it becomes a family favorite. I cook this often, as the recipe is very easy, and requires very basic spices to whip up one delicious bowl of rice with chicken. Heat oil in a cooker, add ginger-garlic paste, salt along with freshly washed pieces of chicken. Mix well, now add 2 cups of water into this (water level should be 1½″ high from chicken pieces). Remove from heat after 2-3 whistles. Open the lid after the pressure has reduced. Heat ghee in a non-stick deep frying pan/kadai. Add all the ingredients mentioned ‘for tempering’, stir for few seconds. Now add sliced onions, sauté on medium flame until light brown in color. Add rice, green chilies and julienned gingers, mix and fry on medium flame for 5 minutes. 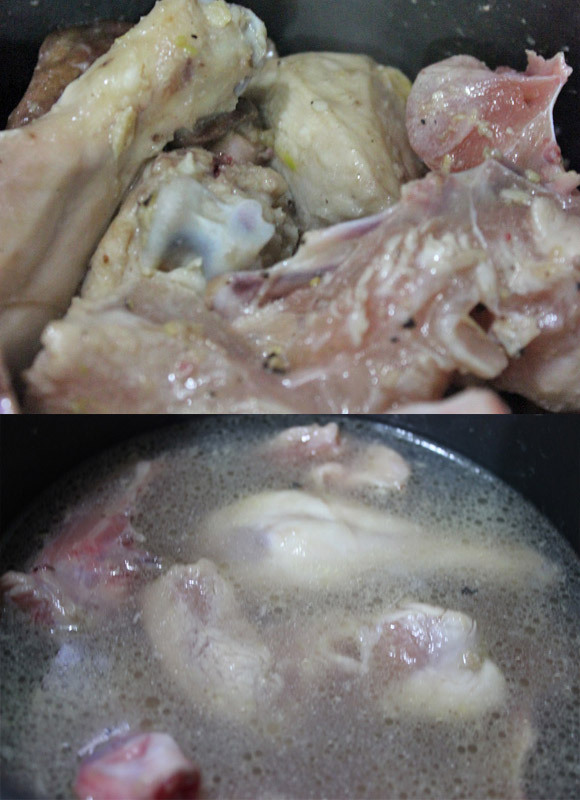 Now add the chicken stock, keep the chicken pieces separate, don’t add them this time. Cover and cook on low flame. When the rice is half cooked add the chicken pieces. Mix well, add the peas. Cover and cook on low flame until done. Add sugar and 1 tbsp ghee when the rice is thoroughly cooked. Mix well and cook for 2-3 minutes more. Check salt, remove from heat. 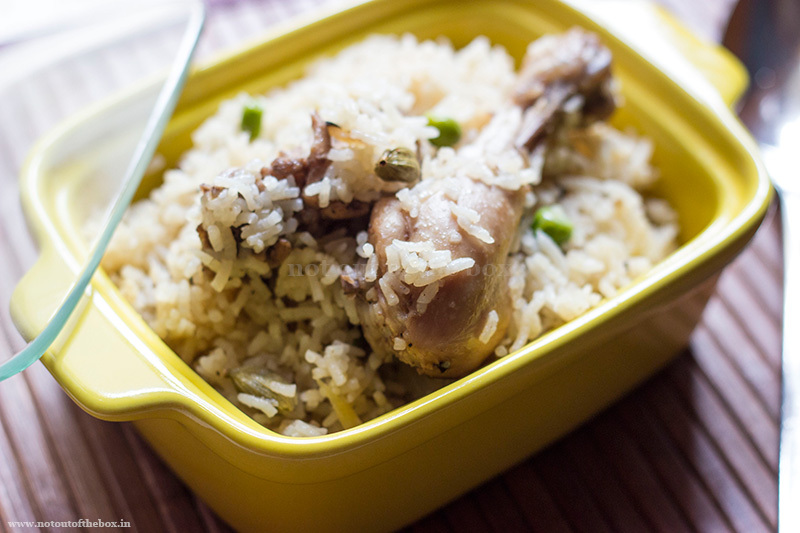 If the rice grains become broken or little overcooked during the time of cooking, let them just like that. 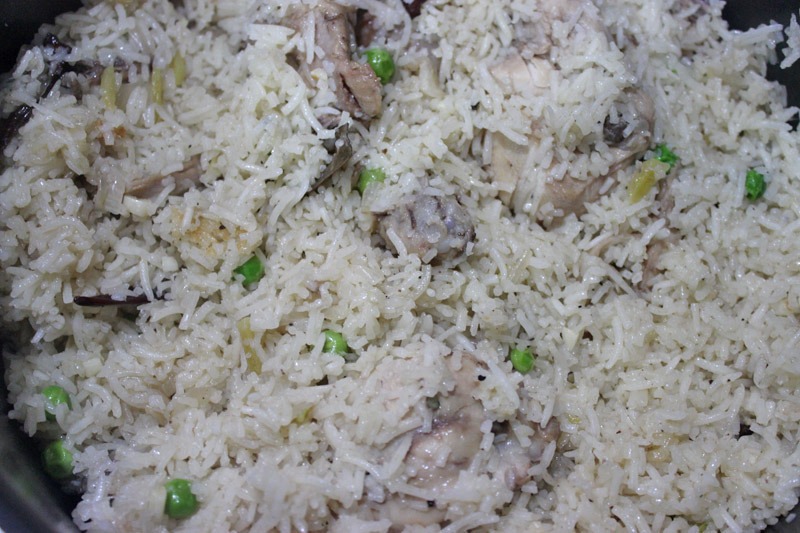 ‘Pish Pash’ is a comfort food, so here the rice can become little bit sticky and broken, and that doesn’t matter at all. Glad you put up this recipe for Pish Pash! This used to be given to us specially when we were unwell as it’s nutritious and so tasty. We would add a couple of halved carrots and a bit of milk to it also ( towards the end), as it greatly improves the flavour. Normally only ghee or butter was used to sauté the chicken pieces though people can use olive oil instead.However, the old recipes used clarified butter only. Hope you can post some more recipes such as Pantras ( pancakes), vindaloos and the such. Your recipe blog is a visual delight! The name too is catchy..